“We’ve made a huge turnaround in the government’s books, we’ve brought in the biggest changes to the tax system in a generation, and we’re making significant changes to reform the welfare system and strengthen work obligations. Meanwhile the Salvation Army has been experiencing the PM’s better future, and its latest report on the State of the Nation makes a plea for better leadership of the social agenda. Teenage pregnancies have decreased and more Māori are engaged in early childhood education, but despite New Zealand’s recent favourable Human Development Index report, the better future is in jeopardy. Abominable Māori incarceration rates (particularly young Māori males), neglected housing problems, growing inequality, and the highest unemployment in 10 years necessitate doing quite a few things differently. If the Christchurch earthquake teaches us nothing else, it reminds us just how we are dependent on other people for our own well-being. Those wanting a good read on how social policy can be used to help create stability during turbulent times might enjoy the Caledon Institute of Social Policy document Guiding principles for social policy budgets. Not into reading? See the three minute ‘all you need to know’ movie instead. Embedded in Gordon Campbell’s article on Inequality and Tunisia, is economics professor Robert Reich’s Youtube piece The Truth about the economy. There is no doubt a better future requires significant change. Relative and absolute poverty causes harm, but rather than decisive action to reduce poverty and inequality, we have organisations reduced to providing child sponsorship of New Zealand children with government looking on approvingly rather than acting on the underlying national scandal. It’s great the Minister is off to Washington to tell them about our early childhood home visiting programmes for vulnerable children, but it is better if the children are not vulnerable in the first place. At the other end of the age spectrum, government is paying some attention to improving rest home care. The Comprehensive Clinical Assessment (CCA), is being rolled out nationally, and helps nurses identify potential problems, e.g. weight loss, incontinence and depression. Residents are assessed across 22 key aspects of their health, such as nutrition, cognition, skin condition and fall with the assessment repeated at least every six months. Use of the tool will be mandatory in aged residential care from July 2015. CCA, is also known as interRAI, is used in 30 countries around the world and is based on proven international research and standards. Maybe some of this could even be done by robot. Selwyn Retirement Village in Auckland successfully tried using robots, and since then four healthcare robots have been deployed by Gore Health to “help reduce costs, save staff time and improve patients' long-term health.” Robots may well be very useful, but we would also wish to ensure our elderly are not bereft of human contact. We would not want to see robots used merely to assist the retirement home industry in getting a big tick from investors. People need jobs; but we keep closing them down. Families go without, and in a double whammy, low-income families find that their Working for Families tax credits are cut by at least $60 a week if they no longer meet the work hours requirement, even though their children’s needs remain the same. There are things we could do, we just do not seem to want to do them. For example, Māori language has potential for improving our economy. We don’t see it as a priority, but we do prioritise spending over $6 million on a new national war memorial. The tokens of the hoped for better future, e.g. launching a Pasifika education plan, signing accords with iwi as part of treaty settlements to improve social outcomes for the hapū and whānau, campaigns around awareness about dementia, more social workers in schools etc. we seem to manage ok.
It’s almost like we are avoiding some of the fundamentals. 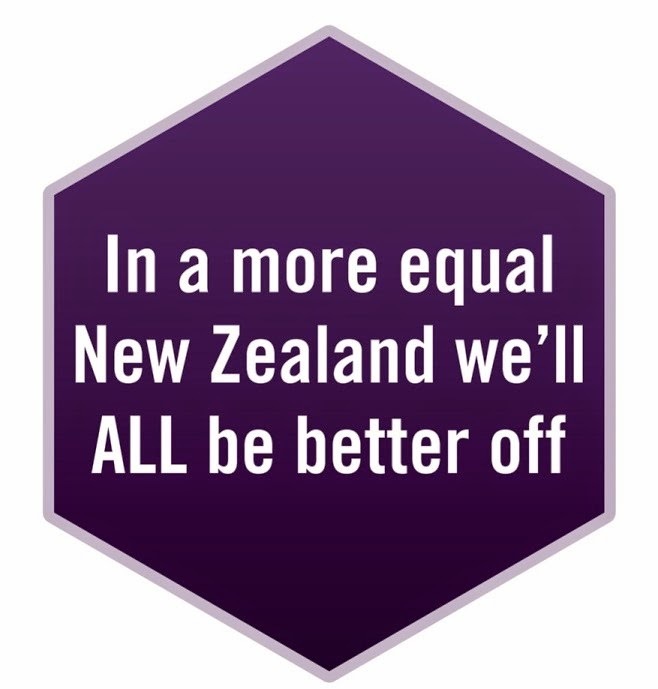 Statistics NZ say our labour market is weak, but our only remedy seems to be to further cheapen work, and having Minister Joyce announce that our unemployment level is better than most OECD countries while conceding employment conditions remain challenging. This is without exploring New Zealand First’s concern about how much of our labour force we are exporting to Australia. Young Labour is disgusted people aged 15 to 24 now comprise 44.8% of those unemployed, and there are now 90,000 young people not working, not studying or not in any training. Government says things have got better because just under 80 per cent of all 15-19 year olds in New Zealand are enrolled in education or training. The increase is hardly surprising since 20 August last year, 16-18 year olds, and 16-19 year old young parents needing government assistance have had to be engaged in education or training (once the child is one year old, in the case of the young parents). Various programmes are designed to assist youth. Projects such as the Northland Wilderness Experience Hut, which is used to assist youth and whānau are a good idea and have their place, but they are not a panacea for young people being unable to take up adult roles because the opportunity is not there. Then there are too many people in jobs who are not paid enough to make ends meet. Enter the Living Wage campaign. The Report of an Investigation into Defining a Living Wage for New Zealand by Charles Waldegrave and Peter King of the Family Centre Social Policy Research Unit identifies $18.40 an hour as the New Zealand living wage. It has quite a few followers. David Shearer announced Labour’s support, the Greens called on the Government to adopt a living wage for all Government employees and contractors, encouragement came from the Presbyterian Church, and Wellington’s Mayor declared she was “keen to see the council adopt a living wage, and encourage other Wellington businesses to do so.” Government support is unlikely. Careerforce is the industry training organisation for the health, aged care, disability, social services and cleaning services sectors. It sets standards for aged care, addiction, allied health, community work, core health, counselling, dental support, employment support, intellectual, physical and sensory disability, Iwi/Maori social services, health care orderlies, health support, mental health, Pacific Island social services, primary and secondary health care, public health, social services - including in suicide intervention, abuse, neglect and violence, Tamariki Ora – Well Child Services, whānau/family and foster care, Whānau Ora, and youth work. • Reduce the number of qualifications. • Make the qualifications framework simpler for workplaces and trainees. During February and March Careerforce is running regional meetings across New Zealand to engage with everyone about the qualifications review. Click here to find your local meeting and register. Investing in Services for Outcomes (ISO) is about changing the way the Ministry of Social Development “works in order to drive positive social development”. “The overall aim of the capability work is to support a stronger, adaptable and more integrated social service sector - an important part of Investing in Services for Outcomes.” Details about the approach can be found here. Updated information about Investing in Services for Outcomes, including the Capability Investment Resource and the Organisational Capability Self-Assessment Tool, is now available on the MSD website. No doubt Paula Bennett, Minister of Social Development is really pleased numbers of people on benefits are falling. So pleased, she puts out a press release. In this case, three press releases. Numbers on unemployment benefits have fallen. They have fallen in the Southern Region – Ministerial Yay. They have also fallen in the Waikato – double yay. And, guess what, they have fallen in the lower North Island – Triple Yay. Oh dear, we just do not seem to be able to get it right on the housing front. Government’s uncomfortable relationship with local government continues with its latest foray into public consultation. Apparently, according to new Housing Minister Nick Smith, the main cause of high land prices are local authorities charging “excessive” development levies on the long-suffering victims – land developers. Apart from the political wisdom of blaming all those local authorities, many of which are run by rural Government supporters, it seems a bit of a stretch to place so much emphasis on this one area in the housing affordability stakes. Easy pickings perhaps, but not a magic solution. Read the consultation document here and make your comments by 15th March. Children, child maltreatment and intimate partner violence: Research, policy and practice One-day conference Co-hosted by the Families Commission and the New Zealand Family Violence Clearinghouse 5 June 2013, 8.30am-5pm Te Papa, Wellington. SSPA seminars Speaker: Dr Nicola Atwool: The Transition from State/NGO care to independence: What’s International Best Practice? Working with Troubled Families: a guide to evidence and good practice This UK report looks at academic evidence, local evaluations of practice, what practitioners have said works in their services and what families saymakes this work successful for them. The parents of every girl attending Auckland's Diocesan School for Girls pay roughly one and a half times as much in annual fees as Ana Malolo takes home for helping to clean the school all year.